— Dietrich Bonhoeffer, German theologian who died fighting against Hitler. This statement reminds me of the Benedictine saying from my youth that if you want to be happy, be grateful for something. I have been keeping close tabs on the Curiosity rover's progress on Mars. While I find many things about Mars interesting, I find the thin atmosphere of Mars especially interesting. If you are looking for some reading on the subject, the Wikipedia has a good article . The rover image in Figure 1 shows that Mars looks pretty bleak. Figure 1: Mars Rover Image Showing Marineris Volcano. During my reading, I have seen different values listed for the altitudes on Earth that have the same pressure as Mars' surface. Let's see if we can understand how these equivalent Earth altitudes are arrived at. This means that the dynamic range of air pressure at the Earth's surface is only 3.14 =106,200/33,730. We see that the dynamic range of air pressure on Earth is much less than we would encounter on Mars. Let's find the altitudes on Earth with the same atmospheric pressures as Olympus Mons and Hellas Planetia. The surface pressure on Mars is equivalent to the range of pressures on Earth at altitudes between ~30 km and ~60 km. That seems like pretty thin atmosphere. Since humans require pressure suits for altitudes above ~19 km (called the Armstrong limit), it looks like people will always be wearing pressure suits while walking about Mars. Too bad -- I actually kind of liked the scenario shown in the movie Robinson Crusoe on Mars (Figure 2). Figure 2: Scene from Robinson Crusoe on Mars. I have to admit it -- Robinson Crusoe on Mars is one of my guilty pleasures. Thank you so much, I tried a few conversions myself with several answers closer to 58,000 feet at the lowest spot. For years I was hoping it was closer to the Himalayan mountains pressure and we could just wear mountain gear and an O2 mask. No way though. The planet is just too small for a deep atmosphere like earth. As a boy, I always hoped we could romp on Mars just like Kit in "Robinson Crusoe on Mars." I guess we are just going to have to keep looking for more planets. It's not that Mars is too small to hold an atmosphere gravitationally, it's that it's lack of a magnetic field like Earth's has allowed the solar wind to blow away any thick atmosphere that may once have existed. If the Earth had no magnetic field, it too by now would have lost its atmosphere. NASA has put together a nice video on how the solar wind can literally blow an atmosphere away -- the phenomenon is called "sputtering". This link is to an article that has an embedded NASA video on the subject. It is really both. Even if Mars had a magnetic field it still would have lost much of it's atmosphere. Earth is losing atmosphere into space all the time. Over time deuterium is becoming a larger percentage of the total hydrogen because it is heavier and thus bound to the Earth by gravity better. But Earth will continue to lose hydrogen and atmosphere in general to a lesser degree. The largest moon of Saturn, Titan, has a surface pressure 1.45 times that of earth, it's not it's size that's really responsible for it's thin atmosphere. Surface temperature is another factor. Colder temperatures mean fewer molecules reach escape velocity. Titan is much colder than Mars. What I saw was that the highest point on Mars had the same air pressure as 187,000 feet altitude on Earth. I have been thinking about the air pressure on Mars, I was wondering how far below the surface of Mars would humans need to travel in order to reach a survivable atmospheric pressure without the use of a pressure suit? 0 - 3000m above sea level on earth is considered the physiological-efficient zone. Above that and decompression sickness may occur; (0m = 101 kPa [760 mmHg], 3000m = 72 kPa [537 mmHg]). Otherwise humans could breath without a mask at the lower martian location since we only need supplemental O2 above 10,000ft (assuming the atmosphere contains O2).. Thanks for the catch. I appreciate when people tell me about errors. Regarding R3P1N5's interesting question (...and the search for any persistent biota) a good focus might be be to first investigate regions on the surface meeting minimum requirements for sustaining liquid water, e.g. conditions greater than the triple point and less than the boiling point. There is a NASA site that suggests a high pressure of 12.4 millibars occurs at the bottom of the Hellas Basin. During times when the temperature there is between 0°C and ~15 °C it may be possible that surface or subsurface water can remain liquid (assuming no ongoing hydroscopic reactions). Now, if that water had been percolating through the substrate for billions of years, (and depending on the substrate involved), we might find some level of tube erosion grossly similar to cave formation on earth. If so, in addition to the known lava-tube caves visible from the surface, this would be an excellent candidate site for xenobiological investigations. The atmospheric pressure should continue to increase and the just-tenable conditions on the bottom of Hellas might become even more favorable. An added perk could be that atmospheric O2 also increases with depth because the regolith itself is known to produce oxygen when hydrated. Perhaps most of the plains of mars are within the 150.000' David Clark,T-1 partially pressurized suit. Don't know about working with the temperatures but the T-1 is lighter, more comfortable although quite tight and far more flexible. It worked just fine for the X-15 and U-2 programs. 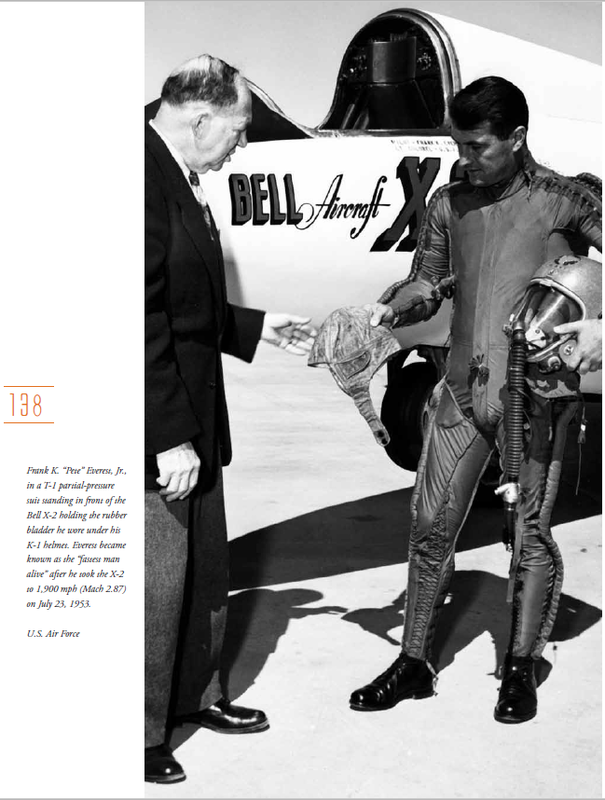 You got me curious about the T-1 partial pressure suit, so I grabbed an old US Air Force photograph of one. And all this air pressure talk has to make one wonder just how *strong* the winds are on Mars. Surely not enough to tip over a huge rocket, ahem, Mark Watney and crew. Perhaps not with the pressure, but with the velocity it might still be able to do that. Anyone know the wind speed on mars? 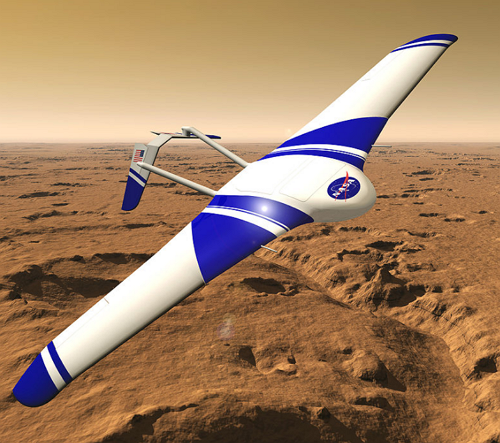 I got interested in this topic as NASA is now talking about flying gliders on Mars... Wondering what the conditions are for the glider compared to earth UAV/drone. Occasionally, winds on Mars are strong enough to create dust storms that cover much of the planet. After such storms, it can be months before all of the dust settles. The maximum wind speeds recorded by the Viking Landers in the 1970's were about 30 meters per second (60 miles an hour) with an average of 10 m/s (20 mph). Just as on Earth, at certain latitudes, the winds tend to blow in certain directions. In Mars' northern mid-latitudes, wind blows from west to east just as it does in the United States. (Local variations of this can be caused by nearby mountains, large bodies of water, the season, etc.) Recent satellite images of Mars show that the dust storms have lessened, indicating that Mars winds have lessened, due to unknown causes. Scientists say that the planet is also getting colder. Airplanes won't work on Mars. I know of no aircraft that can fly at a density Alt. of 93,000 ft. A balloon perhaps.. but no fixed wing/rotor craft. I do not know how real it is, but NASA has discussed small hydrazine-powered aircraft for Mars exploration (link). As usual, they include some nifty artist conceptions. The claim appears to be that a plane could be made to fly in spite of lower pressure because the gravity is lower and the atmosphere is dominated by CO2, which is denser than Earth air at the same pressure. It looks like NASA may soon try to piggy-back onto a CubeSat launch to test out a Mars glider concept (link). Looks like pure thrust or nothin' for gap-travel on Mars. I still think solar powered tumble bots for moving stuff around the surface. Dan, Could this be due to the lack of oxygen at those higher altitudes. We have the Gobi or Sahara to practice teraforming and the moon to practice the srts of survival on Mars like condition while preparing for 2033. Brave New Worlders... is it a go? Neil deGrasse Tyson makes a similar argument – if we can terraform Mars, we certainly should be able to cleanup the Earth. The Martian sky would be pitch black if this were true. They say the point of thickest Martian atmosphere is equal to Earths at 98,000 ft? The sky is black at that altitude. The Martian sky is lit up. We only need to go deep enough to survive passing out in an event of sudden pressure loss, to give astronauts inside any habitat time to get to an oxygen mask then a proper suit and simply survive. How deep is that? Thinking further along in time: We'd also want sunlight at that depth, so we don't have to run wires up to surface level. Imagine a giant east-west chasm dug at the equator, with long slong sloping sides. What's do say that autonomous robots couldn't do that within a few hundred years if we set them to that task?